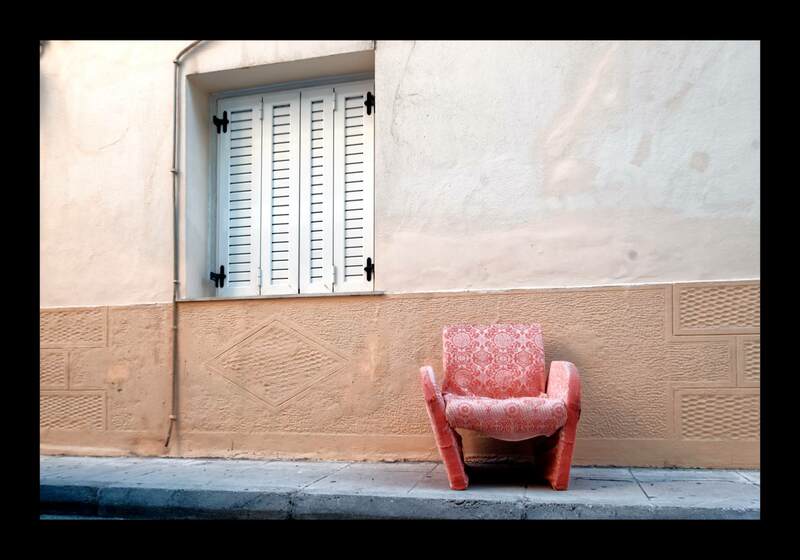 A broken red armchair is left on the sidewalk of a narrow road under the closed window of a house. Armchairs left on the road are strange. They are just an old, broken piece of furniture. But also, they are inviting subjects for photographers. Friends that I have spoken to, have also expressed this opinion. Maybe it is their quality as found objects that make them into photography subjects. A found object is something that is not related and has no function in the place it is located. An armchair belongs to a house. A person should be sitting on it. With every person, there is a story. Yet everything is thrown out on the street, ready to become forgotten. It is not only the armchair as a subject that made me choose to present the photo here. There is a bit of colour theory involved as well. The most important factor is the red colour. Red is the strongest colour and it immediately grabs attention. So, this red armchair is an object that draws attention in multiple ways. This makes an insignificant, ordinary object, a strong subject for photography. It is strange how art works sometimes.